A place to play in peace. Spring can't come soon enough for those who hear the rolling hills of the fairway calling their names: The smell of fresh-cut grass. The distant flutter of a flag just out of sight. Even those damned sand traps. All in pursuit of that satisfying "crack" as your club hits a shiny new ball at just the right angle. 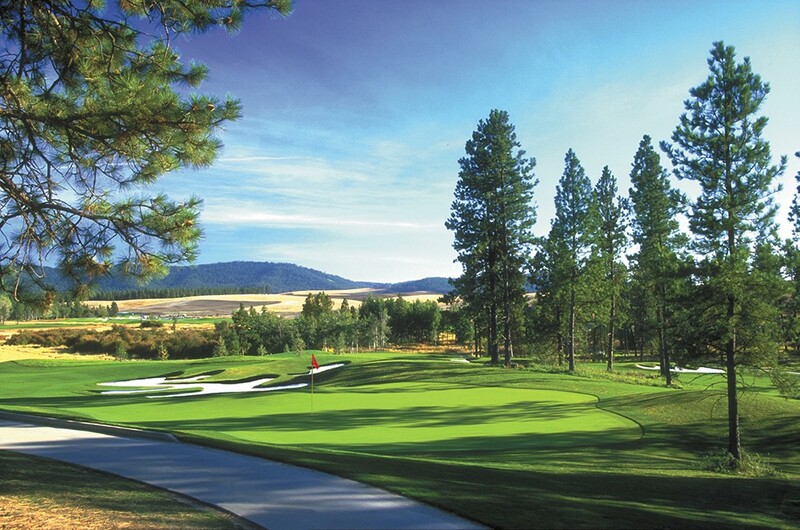 Named among the nation's top courses, the Circling Raven Golf Club at Coeur d'Alene Casino offers a unique, challenging playing experience amid its low-lying hills and acres of scenic forest. Local golfers can revel in quiet seclusion without sacrificing the service and amenities of a high-end resort. "The course, with its surrounding natural beauty, makes you feel like you are far away from the noise of the city," Spokane resident Lisa Poole tells us by email. "The course is very challenging and I like the fact that the holes aren't laid out so close together." First established in 2003, Circling Raven was designed by award-winning course consultant Gene Bates. The 72-par course winds and sprawls across 620 acres of gentle field and rugged woodland. The course also features a dedicated driving range, putting green and an extensive Pro Shop. Fairways run up against amber grassland and thick stands of pine. Mountains rise in all directions. With its winding layout and spacing, local golfers say the course rarely feels crowded. It's made for peace and solitude. For Poole, it's the unique and comforting details that really make Circling Raven stand out. "I love the sound of the golf carts on the wooden bridges throughout the course," she writes. Rates start at $65 for weekdays or $75 for weekends. In late May, the summer rates bump up to $80 and $95, respectively. Fees include access to 18 holes, a golf cart and a practice facility. The casino also offers accommodation packages that pair with access to the course. Kevin Twohig of Spokane says he enjoys Circling Raven Golf Club because the course always keep him guessing. "The course is challenging and offers several different hole layouts requiring the use of most of the clubs in my bag," he writes. "And where else near Spokane do you find moose on the course?"